It's never too early to teach job skills to your kids and our started with chore cards. I mentioned on Twitter a couple weeks ago that I was designing a chore card for my kids, and several people asked me how we use it for our kids' chores. I figured I might be able to explain the system better when I'm not limited to 140 characters, so here goes. In this chore card system, every week each child gets a card of his own like the one below. As you can see on the chore card, each chore has been assigned a monetary value, between 5 and 25 cents in our case. We determine the value of a chore basically by how much time and effort it takes to finish the job. For example, taking out the trash earns only 5 cents, but deep-cleaning the bathroom or vacuuming the hallway, living room, and "Red" room (my music room), earns 25 cents. Each day as a chore is done, the child will check it off his card. At the end of the day, Mom or Dad has to "sign off" on all the work done, validating that the chores were actually completed adequately. This must be done every day because if the chores aren't signed off at the end of the day, money isn't earned for that day. The child has to take the personal responsibility for getting the card signed off; forgetting isn't an excuse, just like in the real world. At the end of the week, each child figures out his earnings for each chore, and then the total earnings for the entire week. Then when Mom or Dad pays out, the payout amount is noted on the card itself. Sounds like an easy way for the kids to make money, right? Well, not really. You see, the biggest rule for the whole system is that a child can't earn money for a chore unless he does it without being asked or reminded. Period. End of sentence. If we have to say, "Please take out the trash" or "Please straighten your room before bed," the chore still has to be done, but without payment. With this chore card system, not only do our kids practice basic math skills when they figure their earnings each week, they're also learning some important life skills and principles. 1. Money must be earned. Wages are an exchange of goods: work and effort for monetary payment. 2. Small amounts over time can add up to large amounts. This is a great way to illustrate that even saving money a little at a time can add up to big rewards. If my son were to do all the chores available every day of the week, he'd earn over $7 a week, and to him that's a lot of money. 3. Be a self-starter and take the initiative; take notice of chores and other jobs that need to be done without having to be told what to do. Oh, if only all employees would learn this! Our chore chart we hope will build the job skills that will help our kids succeed in the future. I'd love to hear about the system of chores and allowances you use in your home. Care to share? 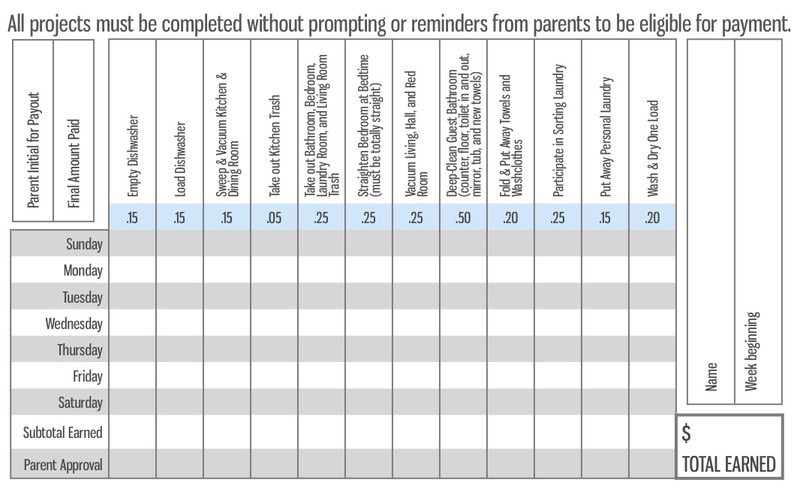 As my own child is still a bit too young to participate in regular chores (I think we'll give him until 6 months old to ask him to vacuum) I've only my mother's system to rate. My siblings and I had regular chores from the age of 5-6 and up. We weren't paid for the regular chores, nor did we have allowances. I appreciate the concept of wages for work, however, mom didn't get paid money for all the chores she did, and so we didn't either. If we needed spending money, we could do special and extra chores to earn that. The chores were divvied up age-appropriate, and obviously, as more of us were able, the individual loads diminished somewhat.So there were some days we didn't have specific chores to accomplish. Not having an allowance encouraged us to get jobs outside the house early. I was working full-time summer jobs at the age of 13-14, and had a weekly newspaper before then. But even earlier than that, we were encouraged to be imaginative and resourceful. My older brother and I started a business making chocolate chip cookies and selling them from our dad's office desk (when he had a desk and an office). $.25 per cookie added up. We even did special orders and catered meetings for other professionals who'd tasted our wares. I was probably 8-9 at the time, and we cleared over $300 net from the business, enough to buy a boat and motors. Of course we had the requisite lawn mowing business as well. All that because we wanted money and we knew how it had to be made, and our parents where flexible to allow us to mess up their kitchen regularly. As far as my children? I probably won't do pay for chores. I think it's important they recognize that not all remuneration is in the form of money, and that there are certain responsibilities that come with having room and board provided. Giving them money for work would indeed impress on them the value of work and of money both. But not giving them money for chores would impress upon them the value of the food and clothes and provisions they receive otherwise gratis. BTW, not sure if you've seen this. But an excellent article from Trivium Pursuit on a similar and complimentary theme: "Ten things NOT to do with young children"
.-= matthew´s last blog ..The Wisdom Of Tom Clancy =-. For completing my chores, I would get to draw a piece of paper out of a jar, and get to do whatever was written on the paper. They were simple things…nothing that really cost my mom any money. Sometimes it was a manicure or getting to play our favorite board game, reading time with mom, etc. @matthew, I totally understand the perspective of not paying for chores. That's one reason we make a distinction. Chores must be done regardless. But if they go the "extra mile" and do it of their own initiative, without being asked, we definitely reward that. There are pros and cons for each perspective. One pro for the pay-per-chore system is illustrated by my son. You see, my son is a spender. Whenever he has money, he spends it immediately. But the first time we started doing this system, I was amazed at the change in him. He started trying to save his money! Even more, when he wanted to spend money, he figured out how many chores that amount was equivalent to. When he realized that spending "just a $1" on something was like having to take out the trash 20 times or deep-cleaning the bathroom 4 times, he determined it wasn't worth it and he actually stopped buying things as readily. That was truly amazing for him! We don't reward for chores, but we do have issues with initiative. I've got to think a bit more about your solution, especially since my children are older. .-= Annie Kate´s last blog ..Homeschooling Curriculum Has Come a Long Way =-. My first time to your blog. At the suggestion of Mama Hall, I'm joining in your carnival too. I have a toddler and we've just started doing crafts and learning memory verses. We're having so much fun together!!! .-= Heather @ Not a DIY Life´s last blog ..Bible Verse Craft – B =-. I should have mentioned the science curriculum: it's elementary Apologia. And, yes, we are continuing with ALEKS. It is SUCH a patient teacher! I love the chore chart. I only wish we were that organized around here! Thanks for visiting The Prudent Pantry. I think I linked back to you correctly this time. Thanks for a great site and some really useful information. We have tried a wide variety of chore systems. My children are newly 5 and 7 (summer birthdays). I agree with the concept of paying children for some things – but requiring some chores for the pure pleasure of getting to live in our home and be a member of our family! .-= Michele´s last blog ..Our Classroom =-. I really loved this post and would like to adopt this system for my own kids, despite my long-held conviction that household chores should NOT be viewed as paid work–I really like how you made the distinction that the chores must get done regardless, while at the same time creating an incentive to foster self-motivation (and the nagging and following behind everyone to make sure it gets done is slowly driving me crazy, hehe!). Before I get onto Excel and spend time reinventing the wonderful wheel (i.e., chore card) you've already created, I wanted to ask if you'd be willing to post a downloadable file of yours that I could modify for my family's use? Thanks so much for taking the time to run this site!